The projects vying for the Best Tall Building Americas session squared off in session 2A, which was chaired by Zurich Esposito, Executive Vice President, AIA Chicago. Presented by Joel Breitkopf, Principal, Alchemy Properties, and Daniel Kaplan, Senior Partner, FXCollaborative, the 35XV project in New York City arose out of a need for the Xavier High School to expand on a tight mid-block site in the Chelsea neighborhood. The high school was able to use its air rights to facilitate its own expansion as well as finance that expansion by way of a mixed-use condominium / educational development. The ultimate solution became 35XV, a 25-floor building that stepped back from the street, while cantilevering over the school grounds on the rear of the site. The project introduced numerous challenges, especially around separating the very different usage conditions of the program and providing distinct but contextually appropriate entrances. Difficult site conditions also ruled the day at 150 North Riverside, an office building in Chicago that was presented by Anthony Scacco, Executive Vice President, Riverside Investment & Development, and James Goettsch, CEO & Partner, Goettsch Partners. 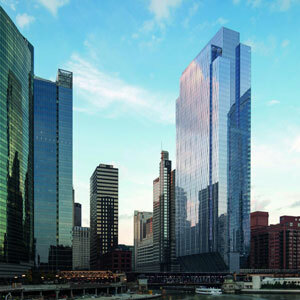 The site is located prominently at the confluence of the three branches of the Chicago River and less than one block away from one of Chicago's busiest commuter train stations. With exposed railroad tracks on the west side of the site and the city requirement for a riverside pedestrian path on the east side, the remaining area on which to build was considered impossibly narrow, and the site sat undeveloped for decades. Utilizing a unique core-supported structure with a very small footprint at grade, the design resolved the site challenges and provided a 51-story Class A office tower with efficient, column-free floor plates. Some of the engineering feats that made this possible included one of the largest I-beams ever constructed, to carry the project over live tracks, and a 20:1 aspect ratio for the core, supporting 45-foot (13.7-meter) lease spans without any perimeter columns reaching the ground. As there was practically no laydown site available, “we fully fabricated all of the trusses on the shop floor of the fabricator’s facility,” Scacco noted. The slimness of the building meant that 75 percent of the site became a usable public space, delivering extra value to the surrounding properties, as well as for the developer, he added. 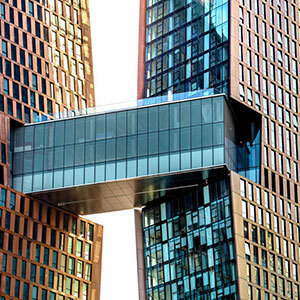 Another riverside site formed the conditions for New York’s American Copper Buildings, a pair of “leaning,” copper-clad apartment towers connected by a skybridge. Presented by Simon Koster, Principal, JDS Development, and Gregg Pasquarelli, Principal, SHoP Architects, the American Copper Buildings offer 761 units alongside the East River, 20 percent of which are set at affordable rates in notoriously expensive Manhattan. The unusual profile of the towers, which appear to “dance” and “kiss” where they join, invigorates the sometimes-unloved East River frontage, Koster noted. That same unusual structural gesture made bidding the job difficult. “No one wanted to build it, so we started our own construction company,” Koster said. “Instead of having two separate buildings with two separate amenity packages, we said, ‘let’s celebrate this new community and bring it together across this skybridge,’” Pasquerelli said. The common amenities for both towers – including a swimming pool that allows one to swim from one tower to the other – are located in the skybridge. It also serves as a conduit for mechanical equipment, freeing rooftop space on one of the towers for more amenities. As to the choice of copper for cladding, “We really believe in using historic materials, but using technology to fabricate and deliver them in contemporary ways,” Pasquerelli said. The idea was that the copper would patinate over time from the color of a shiny penny, to a chocolate brown, to a green like that of the Statue of Liberty. That could take anywhere from 15 to 50 years, “which would give me something to live for – waiting for my tower to turn green,” Pasquerelli said. He did not have to wait as long for validation of the project’s concept – American Copper Buildings won the 2018 Best Tall Building Americas Award. The entry of the Gaia Building in the race was significant, not only for its design originality, but for being the first building from Ecuador ever to enter the CTBUH Awards program. Presented by Gabriela Anker, Principal and Cofounder, Leppanen + Anker Arquitectos, the Gaia Building is remarkable for using glass fiber-reinforced concrete (GFRC) panels on its exterior, giving it a contoured form that echoed the intensity of the Quito neighborhood in which it sits, as well as numerous well-shaded and unusually shaped balconies and overhangs. Joel Breitkopf, Principal, Alchemy Properties, speaks on the collaboration involved in developing an expansion for Xavier High school alongside the creation of residential units at 35XV. Participants learn about several impressive projects from the past year in the Best Tall Building Americas session. 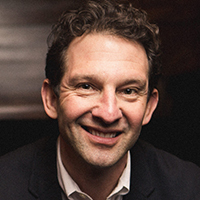 Daniel Kaplan, Senior Partner, FXCollaborative, details the design challenges involved in 35XV, a mixed-use condominium / educational development. Anthony Scacco, Executive Vice President, Riverside Investment & Development, and James Goettsch, CEO & Partner, Goettsch Partners, relay the difficult site conditions that posed challenges for the construction of 150 North Riverside. Members of the audience focus on the Best Tall Building Americas speakers. Gregg Pasquarelli, Principal, SHoP Architects, discusses his firm’s project, American Copper Buildings in New York City, which was chosen as Best Tall Building Americas. 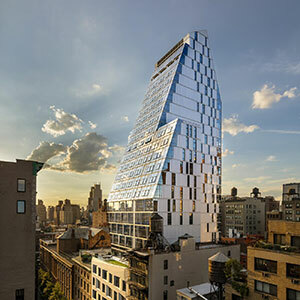 Simon Koster, Principal, JDS Development, elaborates on the unusual structure and profile that makes American Copper Buildings distinguishable on the Manhattan skyline. 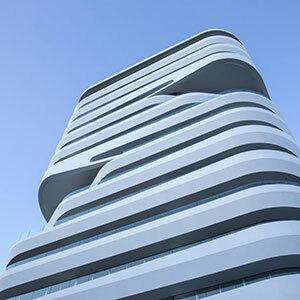 The project went on to win the award in the Best Tall Building Americas category. Gabriela Anker, Principal and Cofounder, Leppanen + Anker Arquitectos, talks about the design originality that differentiates the Gaia Building, which is also notable as the first building from Ecuador to enter the CTBUH Awards Program. Session Chair Zurich Esposito, Executive Vice President, AIA Chicago, introduces the presentations for the Best Tall Building Americas category. Joel Breitkopf, Principal, Alchemy Properties; Daniel Kaplan, Senior Partner, FXCollaborative; Gabriela Anker, Principal and Cofounder, Leppanen + Anker Arquitectos; James Goettsch, CEO & Partner, Goettsch Partners; Anthony Scacco, Executive Vice President, Riverside Investment & Development; Simon Koster, Principal, JDS Development; and Gregg Pasquarelli, Principal, SHoP Architects pose for a photo at the conclusion of the session. CTBUH Executive Director Antony Wood, CTBUH Trustee and Jury Chair Karl Fender, Director, Fender Katsalidis, and the rest of the Trustees Jury listen to the Best Tall Building Americas presentations.